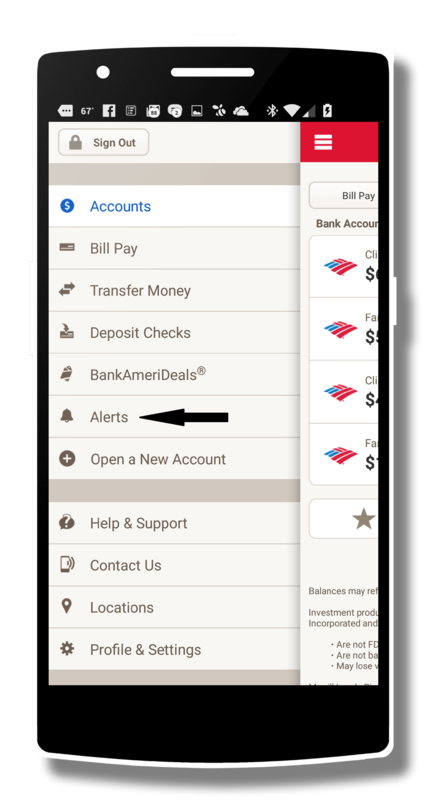 The official Bank of America app for Android has been updated with several new features including fraud notifications and the ability to verify your transactions within the app. The updated versions, 6.4.2 for those keeping score at home, is available for both Android Phone and Android Tablets. Along with this fraud activity notification feature, there are several other new features for consumers and for small business customers of nations 2nd largest bank. With the new fraud activity notifications in the Band of America app, customers can verify transactions from within the app itself and, if all is good, can unblock their card. To set these up, you will need to activate notifications within the app. I’ve highlighted it with the arrow in the screenshot to the right. Customers can also open up a new account which is now an option on the main menu which before was limited to only on the web. In addition, you can now see the total amount of your scheduled bill payments so you can keep track of money flowing in and out of your accounts completely from your phone or tablet. Finally, for those of you who are small business customers of Bank of America, you can view your credit card transactions along with additional account details to make managing your cash flow a bit easier while you are on-the-go. The Bank of America app is free and if you are a customer you will need your BofA online credentials to log in and see your accounts. If you are new customer you can sign up and open an account from within the app itself. Why did the windows phone app het pulled. Why is bank not letting windows phone users know that the mobile site in fact does work on Windows phone browsers. Very frustrating to see accolades for bank that abandoned population of their mobile customers. Why did the windows phone app get pulled. Why is bank not letting windows phone users know that the mobile site in fact does work on Windows phone browsers. Very frustrating to see accolades for bank that abandoned population of their mobile customers.